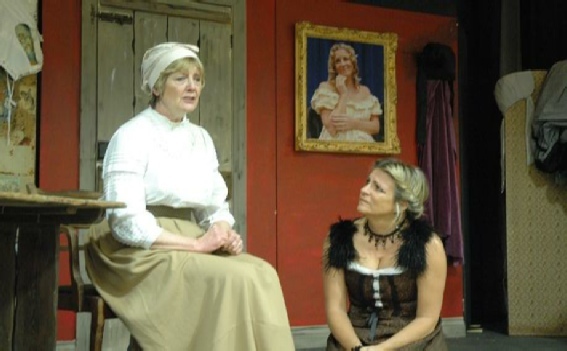 Two Sisters is set in a small Russian town in 1880 and centres around the life experiences of two sisters Sonia and Anya, both in their forties who have fallen on hard times and now live in spartan lodgings and relative poverty. Anya, the younger, is free with her favours to men, has a limp and drinks a lot. Sonia is stuck in a loveless marriage. A coffin unexpectedly arrives at Anya's lodgings and triggers a series of reactions and reminiscences by both sisters spanning the full range of their emotions, expressed in both hilarious and tragic terms. The cast and crew did St Albans Players proud at the quarter finals of the One Act Competition last weekend with their production of Two Sisters - which was received well by the audience and adjudicator with very positive comments from all, but unfortunately we were not the winner and won't be going forward to the semi-finals. Congratulations to Barbara Crass and all involved on what has been a long but very productive and enjoyable journey. Another successful outing for St Alban's Players at the Avon (AAD) One Act Festival on 21 February 2015. Two Sisters won Best Costume, the Adjudicator's Award for Direction and also Runner Up; in addition, there were two Nominations for Best Actress and one for Technical achievement. Two Sisters goes forward to the next round, the Wessex Quarter Final on 18 April 2015 at The Olympus Theatre by virtue of its success at the Bristol One Act Festival. Two Sisters was performed at the Bristol One Act Festival on 7th February 2015. The production won the Festival's awards for both best costumes and best set. Overall Two Sisters gained second place at the Festival and progresses to the All England competition's quarter finals. It was particularly pleasing to receive the Festival's audience award for best play amongst all the 13 that were staged.